I've finished building all of my existing plugins for Carrara 8 for the Macintosh and you can download them from my website www.Sparrowhawke3D.com. There are two packaged sets; the one that you can get from the main page and you can find more plugins in my Laboratory. I got a Mac mini with OS X 10.9 and it not only took longer but was much more difficult to build the plugins than I expected. What I am still not certain of is which OS X versions I can support. For the 32-bit versions they should work for OS X 10.4 and above and for 64-bit I believe you need to have 10.5. So I'll need some feedback if you can or can't get the plugins to work under any particular OS X version (or animal). They will not work on a Power PC, I can't build for those. 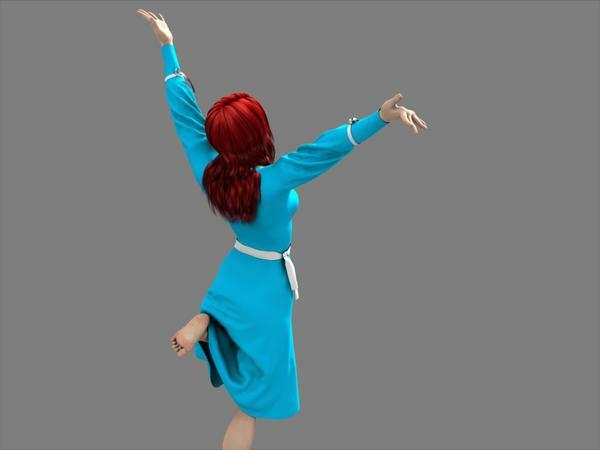 There is also an updated version of my Jiggle plugin for Windows and Macintosh which has a fix for figures with a higher render quality mesh. And for those of you who are interested I've finally released a new version of my Cloth deformer. I've posted a few of the results I achieved with this, here is one recent design that I've not finished with yet. The skirt, upper sleeves and ribbons are dynamic and the rest conforms. Wow. Cool write-up in your lab notes. I might just have to give this Cloth sim a try. Looks really cool. Just last week I was frustrated to see they weren't Mavericks ready yet; now they are! It is really a hazard, but I was precisely going to put the question to know if somebody had already used these plugins… the tests which I made do not function although I followed the tutos at the same time. I am on PC/w7-64 with C8pro. LABORATORY plugins working GREAT on my Mavericks Mini under C8.5 64bit... which is useless confirmation since that is exactly what you built them on... LOL! I've used some of them. Which ones did you mean, and what went wrong? I tested, a few times ago, the options “Belt drive”, “Clothe” and “tracks & Chains”… I followed at the same time the tutos but I did not arrive there. In fact, these plugins could interest me, if you are able to use them on PC, I can still test. Do you have some explanations ? I haven't used those.... I had to work my way through a few failures with Jiggle (and the manual a few times) before I "got" it. If the plugins do not appear in the menus or toolbars then make sure they have been correctly installed into the ../Carrara/Extensions folder. For Mac users you need to show the package contents for Carrara before you can install the plugins. If when you try to use a plugin you get an error like "Failed to load Jiggle.mcx" then make sure that you have downloaded and installed the correct version. For every main release of Carrara you must install the matching plugin specifically built for that version. If you are using Carrara 8 64-bit you must install the 64-bit build of the plugin. If Mac users with Carrara 8 and any version of OSX 10.4 through to 10.8 have success or failure I'd appreciate the feedback. Thanks Holly for useful confirmation that they work on another Mavericks system. If you are having trouble understanding how to use one of my plugins and the user manual is too detailed then email me directly and I'll try to help solve any specific problems and questions you might have. I do use OS X 10.4.11 as my main OS on a PPC machine with Carrara7.2 Pro and I have successfully used you Jiggle deformer in an animation with render nodes that were installed on a PPC MDD G4 running OSX 10.5 and a 64 bit Intel Core 2 Duo running Tiger or Snow Leopard at the time- can't recall for sure which version at the time. I know it's not C8 or later, but I figured you may like to know that it seemed to run fine in a mixed Mac environment. The Carrara 7 builds for Mac were done more than a few years ago. These do not contain the new updates for Jiggle and the latest Cloth. I have tried to do a rebuild for Carrara 7 with the latest code but couldn't get that to compile yet. It is good to know that things were working on Mac Render Nodes, this is something I can't test. I just updated the plugins section of the Carrara Information manual to mention the Mac versions. When a plugin is installed, one is not sure that will function in the program. Thanks to this thread, I obtained until now of good performances with “Belt” and '“Spring”. They are formidable plugins, if the others are same quality, they are marvellous! I've finished a quick tutorial for the Cloth plugin and I'll work on putting more together to re-create how I did those simulations posted in my Laboratory Notes. The second tutorial is ready too. This one is a bit more interesting and shows how to use my Cloth Deformer with a bed sheet draped over a figure.